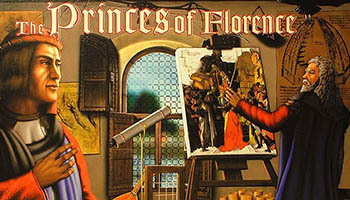 Players attract artists and scholars trying to become the most prestigious family in Florence. Each player is given a palace grid and reference chart and attempts to gain the most victory points after seven rounds. Scoring victory points can be done in a variety of ways although most will be earned by playing profession cards to generate work points. There are a variety of professions such as astronomers, organists and architects. Each is attracted to a particular combination of building, landscape feature, and social freedom. The more the player can match these preferences then the more work points are generated. If a player satisfies the minimum requirement of work points, which increases each round, then the work can be created and the player can then trade the work points for cash and/or victory points. Experience the golden age of the Renaissance. Assume the role of the head of an Italian Aristocratic dynasty and lead your family like the Medici or Borgia. The players support the builders, artists, and scholars so that their completed works will bring their families fame and prestige. 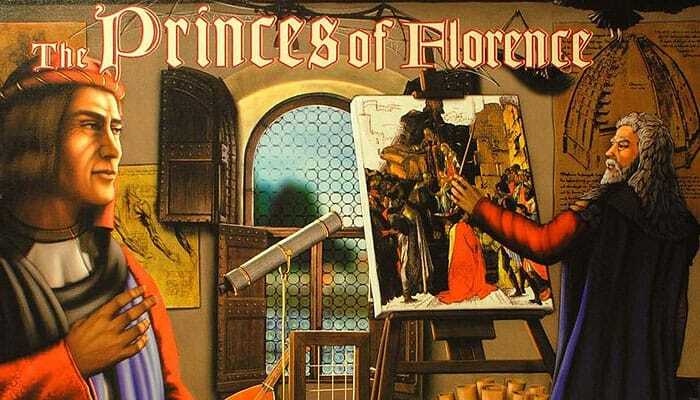 As the patrons of the creators of great works, the players seek to multiply their fame and reputations, but only one will become the most prestigious prince of Florence! This expansion is not a complete game, but must be played with Princes of Florence. We think it will appeal to those who are experiences with the basic game and want more from the game. We do not recommend players try the expansion until they have played the basic game.